The recipient of this year's Lawrence ArtWalk Featured Artist Award, which was voted on by her fellow ArtWalk artists, is Barbara Solberg. Originally from Pittsburgh, Pennsylvania, Barbara is a very accomplished artist who has been painting subjects related to the landscape in her adopted state of Kansas, which has provided her with unending inspiration for over 35 years. Barbara's award-winning work ranges from pastels to mixed media using found and natural objects, and the initial creative inspiration for her art is always place, whether familiar or new. Along with her geographer husband, she has visited many important Native American sites in the Southwest and Midwest as well as historic places in Europe. Barbara's fascination with ancient cultures began in England when she lived there 40 years ago. Her latest series of pastel landscapes and collages were inspired by a trip in 2009 to the islands of Orkney, Shetland and the Outer Hebrides in the British Isles. The islands' raw landscapes were fascinating because they seemed familiar yet unknown. Familiar because the treeless rolling hills, green pastures and fields reminded her of the Kansas Flint Hills - albeit surrounded by water! Familiar, too, because the kindness and friendliness of the local people were reminiscent of the people of rural Kansas. 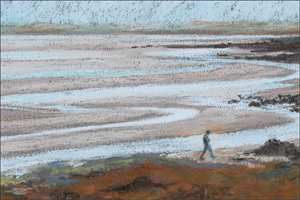 Her series of pastels included 'Contemplation - Western Isles' (detail above), which is featured on promotional material for this year's Lawrence ArtWalk and shows another facet of the islands' landscape that differs physically from Kansas. Barbara was intrigued by the complex patterns the receding tide made along the shore, and created an image that exudes a certain quietness and invites restful contemplation. Collages were inspired by the islands' many historic rings of standing stones. By stitching natural found objects to layers of handmade paper, Barbara created deep textures that added visual strength to the collages. For over 25 years, Barbara's work has appeared primarily in Kansas in solo exhibitions, group shows and juried exhibitions, especially the Smoky Hill Art Exhibition, Hays, and the Smoky Hill River Festival, Salina. She has also been selected for many state and national Pastel Society exhibitions; and has received numerous awards, including Best of Show, Smoky Hill River Festival, Salina (1986) and First Place, 2D, Mulvane Mountain/Plains Art Fair, Topeka (2003). Her work is included in many institutional collections in Kansas as well as in numerous private collections in the USA, Europe and Brazil. She is a Signature Member of the Pastel Society of America. Barbara has a home studio near Lecompton and currently works for University of Kansas Continuing Education. She has a B.F.A., Painting (with Distinction), University of Kansas. More of Barbara's work may be seen on her Lawrence ArtWalk 2010 artist's page.